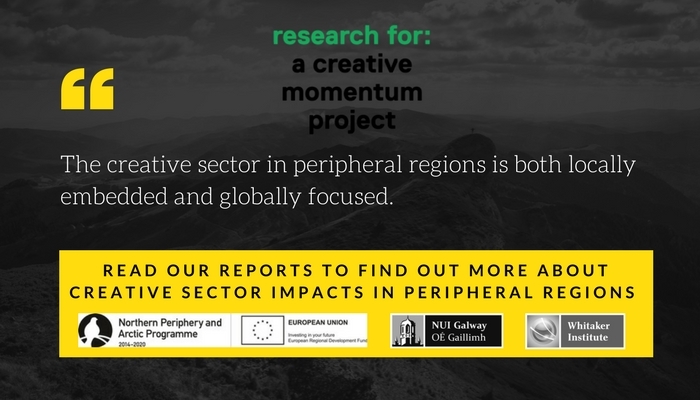 Supporting the development of the creative economy across the five project regions is a key aim of a creative momentum project. One of our wider activities, led by National University of Ireland, Galway, is gathering evidence to help shape future policy and support programmes. A key part of this work has been assessing the economic and social impact of the creative sector in the partner regions. Last year a creative momentum project asked creative entrepreneurs to complete a survey to help us gather data on the creative sector’s value. We also carried out in-depth interviews with over 30 creative entrepreneurs. We’ve now published our findings on the value of the creative economy in each of our partner regions. The evidence we present highlights its important role in supporting more balanced, sustainable development in peripheral regions. Our impact assessment reports present key estimates of the creative sector’s economic contribution to the partner regions. We present economic estimates on sales and exports as well as the total value of the sector to each region. The extent of the sector is also measured in terms of company and employment figures. Future prospects for the sector are also presented, outlining a positive picture for future growth. Our analysis goes beyond traditional economic measures, but also looks at the social value of the creative sector. The stories creatives told us during interviews form a central part of this assessment. Across all of our partner regions we find evidence that the creative sector is embedded in the local economy, but also internationally and globally focused. The sector also contributes to re-inventing perceptions of peripheral regions as attractive and creative places. It helps build social capital within the entrepreneur and wider community. Creative entrepreneurs are collaborative and share knowledge to build a supportive entrepreneurial environment. They are also involved with education and community projects contributing to positive social and community impacts.